the boy loves pizza. and when i say loves pizza, i really mean loves pizza. to better illustrate my point – he has birthday pizza on his birthday instead of birthday cake. yes, birthday pizza. 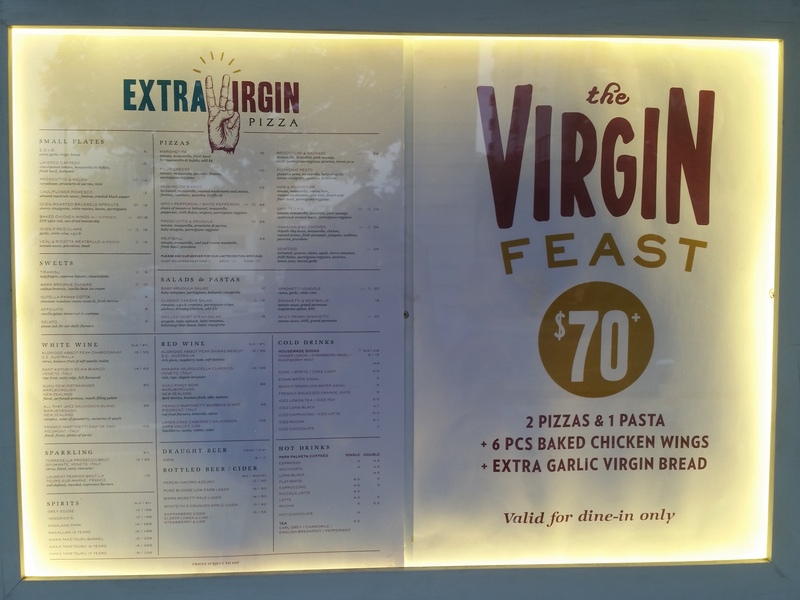 so it was only right that we pay a long-overdue visit to extra virgin pizza, after we got wind of some people dubbing it the best pizza in singapore. 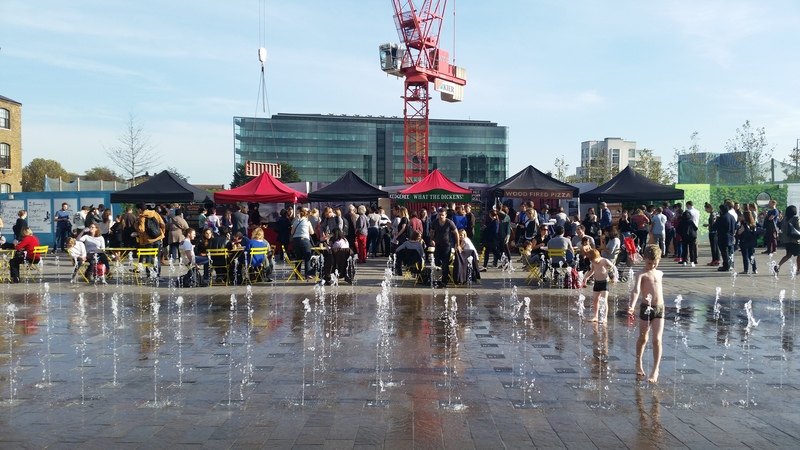 they have 2 outlets on our island, one catering to throngs of cbd workers on weekdays at asia square, while the other serves more families and young folk at united square. 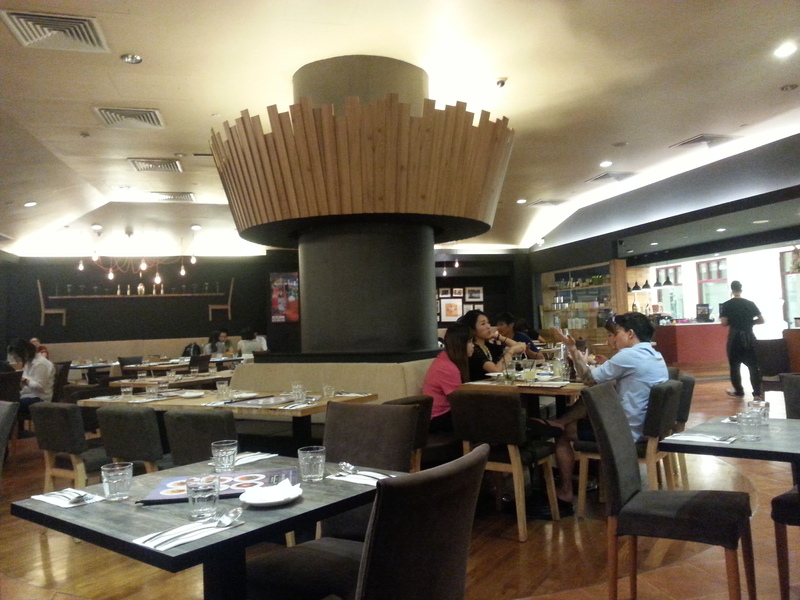 at united square, they occupy a large shop unit with high ceilings and big glass panels which makes for a very nice dining setting, casual yet giving off quite a hip and happening vibe. 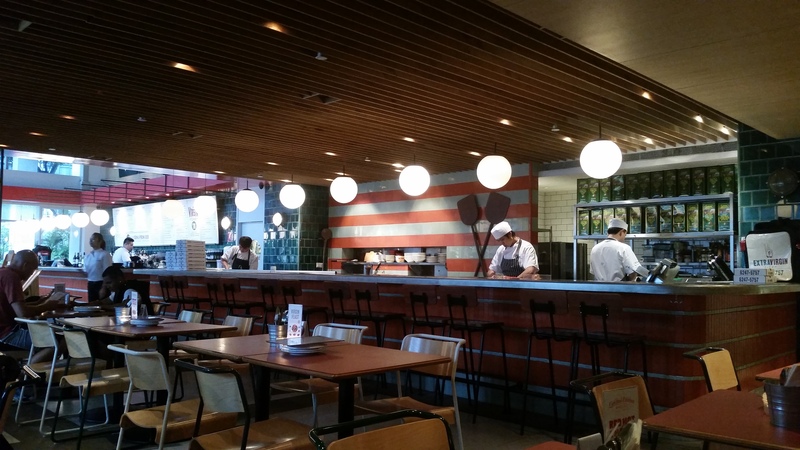 they have a long open kitchen counter where you can observe the chefs at work, and the tables are well-spaced out so that everyone is comfortable and can speak to each other without having to strain any ears or voices. also, i would imagine this would make a great place for dining in large groups because their spacious restaurant space afford them the ability to very easily join smaller tables together to form one long table. 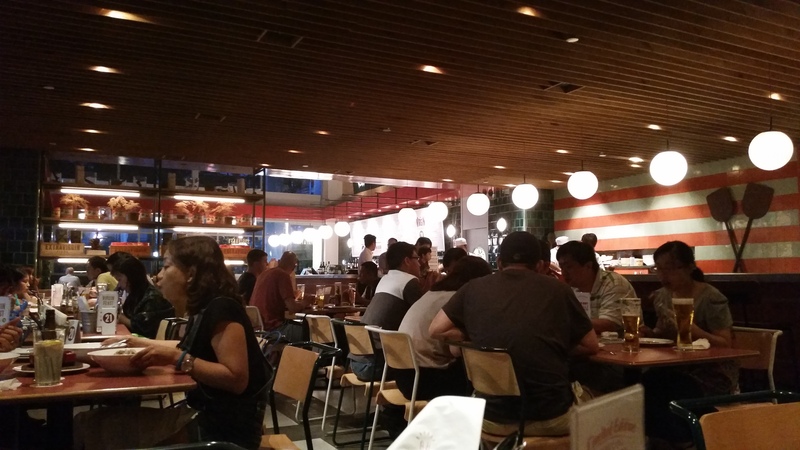 this picture was taken at 6+ on a weekday evening before the crowd came in; it got a lot more crowded after! 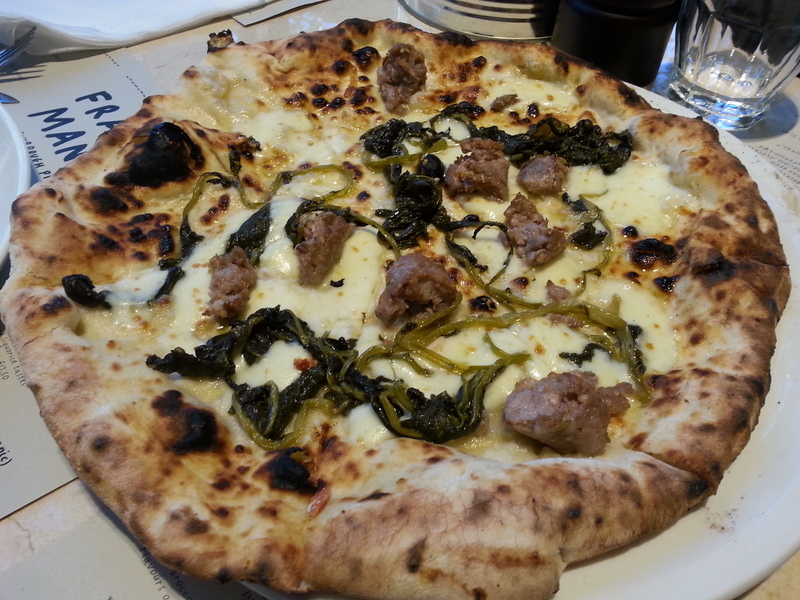 their menu offers sides, starters, pastas, pizzas, drinks and desserts, though of course they are most well-known for their artisanal neapolitan-style pizzas. 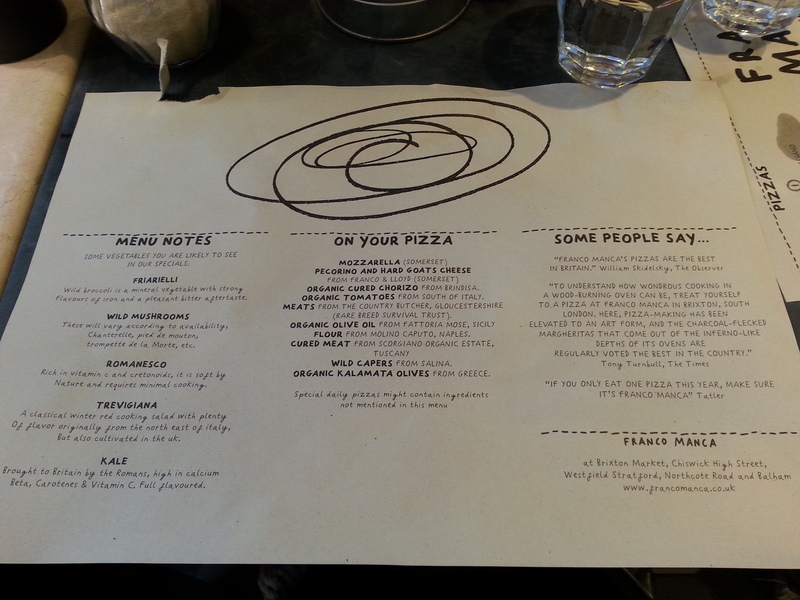 for the size of the pizza, we thought it was priced rather steeply at $26. i suppose the high price comes from the fact that they use only the best all-natural ingredients without any preservatives or additives at all – extra virgin olive oil (of course, given its name), pizza flour that is said to be the best in the world, and imported cheese and assorted toppings. 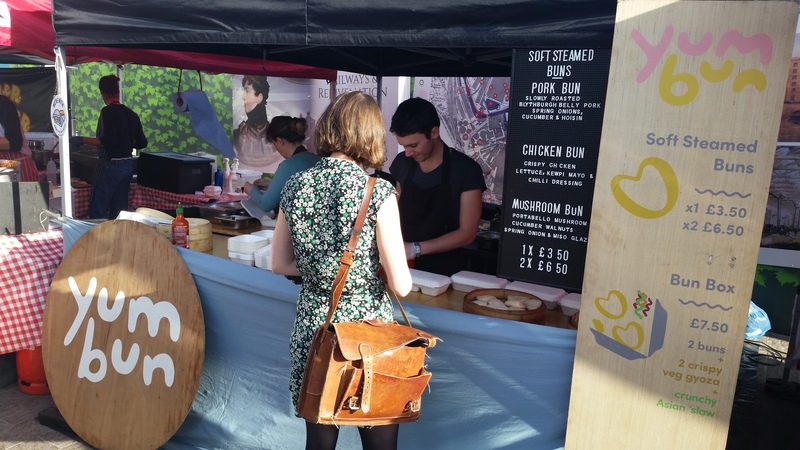 after taking my first bite, i was struck by how the quality of the ingredients really shone through. 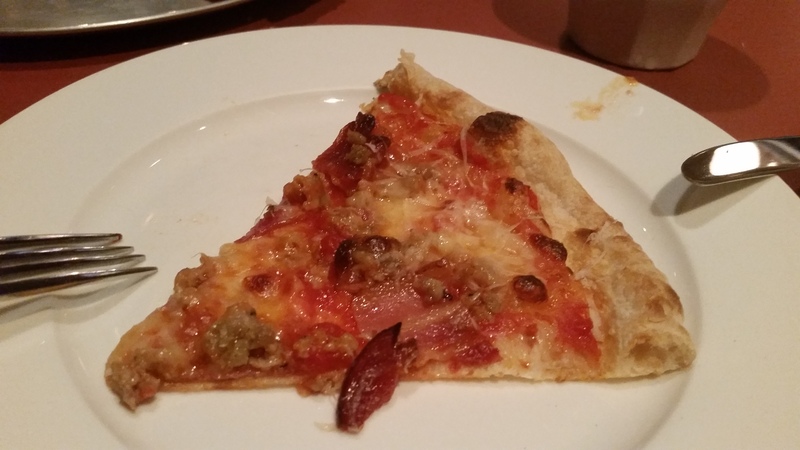 the toppings did not taste processed at all like many of the more mass-market pizzas, and they were not overly-seasoned or piled onto the pizza such that it remained light and allowed for appreciation of the amazing crust. the boy on the other hand, initially wasn’t as pleased as i was (i suppose boys still prefer things in large quantities, things that are hearty juicy saucy tasty artery-clogging) but later came to really enjoy it too! 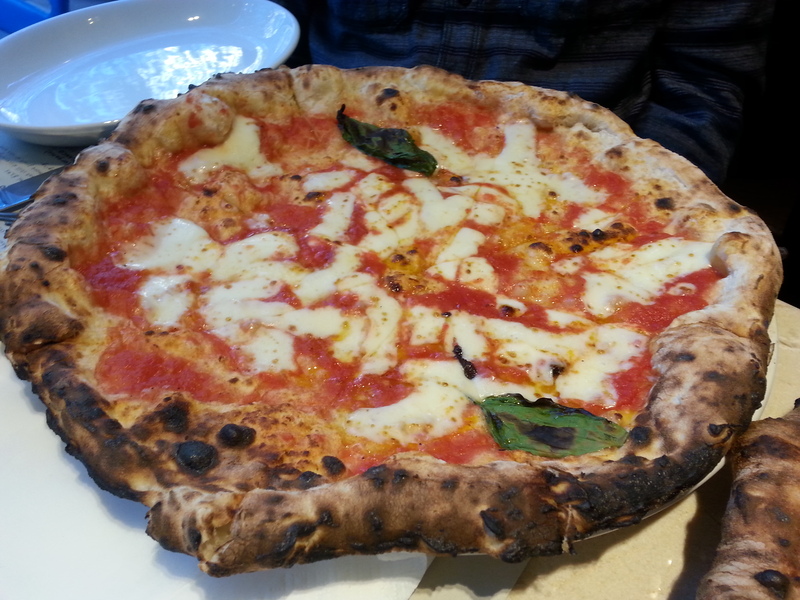 the tomato sauce was fresh and light, slathered onto the pizza in just the right amount. it went very well with the toppings and cheese, and brought everything together to make for a very tasty pizza. 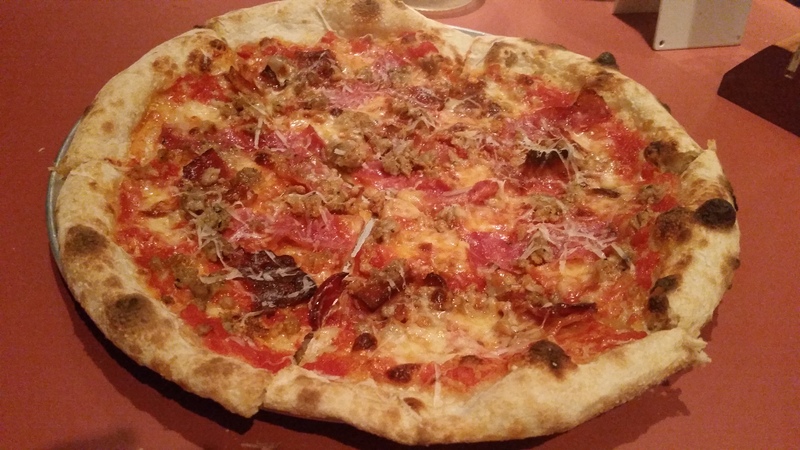 i thought the mix of bacon, pork sausage and pepperoni was a little too salty at times, but otherwise it was all great. as for the crust, it was perfect!!! i absolutely loved the crust!!! thin and crispy on the outside with a subtle smokey yet lightly sweet taste, but so wonderfully fluffy and chewy inside. apparently the pizza dough is left to age for 3 days with live yeast, before being hand-stretched and baked to order in extremely high heat ovens. so light that i could go on eating the crust forever, but yet tasty. i think its pretty hard to achieve a thin pizza crust that retains some kind of chewiness (think the ultra crispy crispbread-like crusts at skinny pizza), but the crust at extra virgin pizza really hits the mark and is completely on point at doing that. 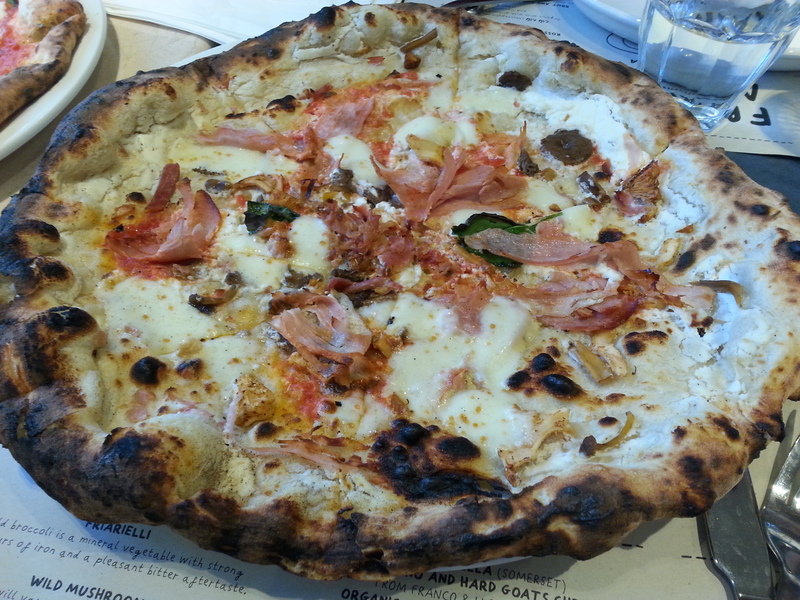 the little charred bits (characteristic of authentic neapolitan pizzas) on the crust adds to its yumminess. 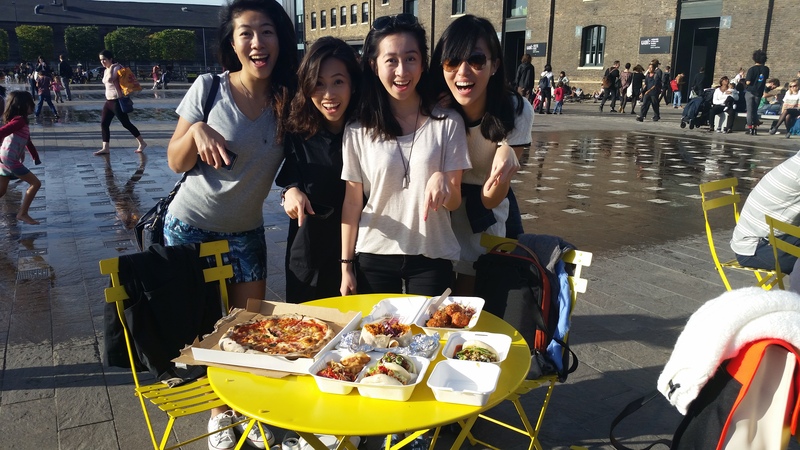 you won’t be seeing any bits of crust left on people’s plates here, that’s for sure! this was a really clever concoction which i thoroughly enjoyed. the pistachio pesto was super yummy; i imagine it would also go amazingly with some pasta/spaghetti! it made the pistachio nut lover in me extremely happy. 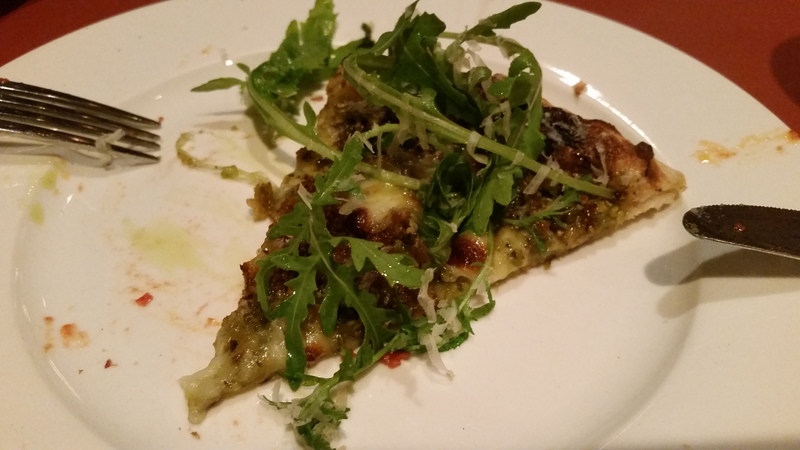 the nutty fragrance of the pistachios really came through, and added a great texture and crunch to the pizza. all the toppings came together perfectly and the pizza was so tasty that it didn’t feel like we were eating something completely meat-free at all. the addition of the lemon vinaigrette was also wonderful, it balanced out the slight bitterness of the argula, and went perfectly with the pistachio that seemed to have caramelised from the high heat of the oven – so good! 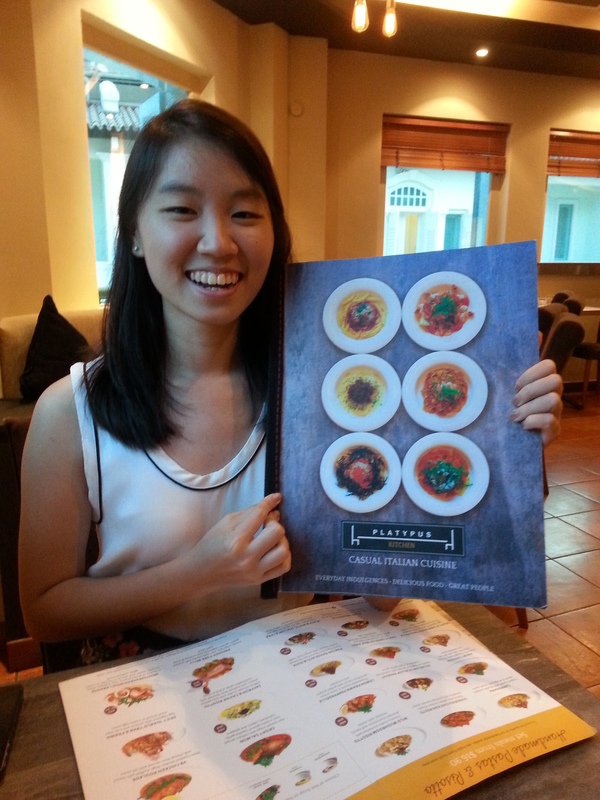 though pricey, extra virgin pizza does serve some very good pizzas made with top quality ingredients. 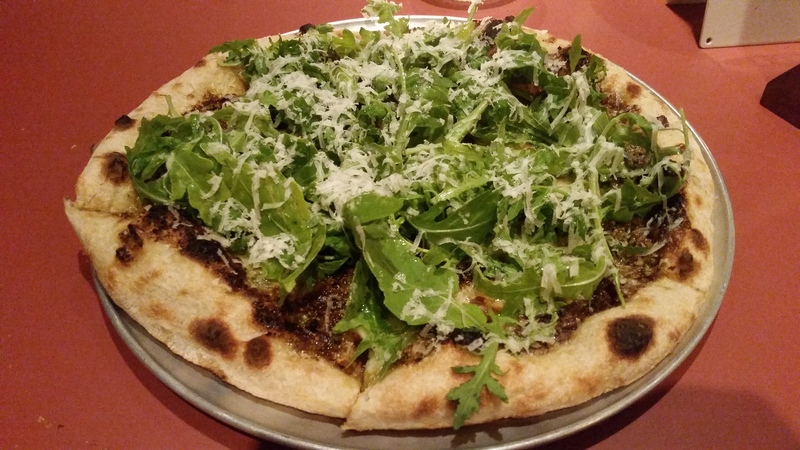 definitely worth trying if you’re craving pizza and looking for someplace different from your usual pizza haunts to check out! service is also friendly and efficient, which makes for a very pleasant dining experience. 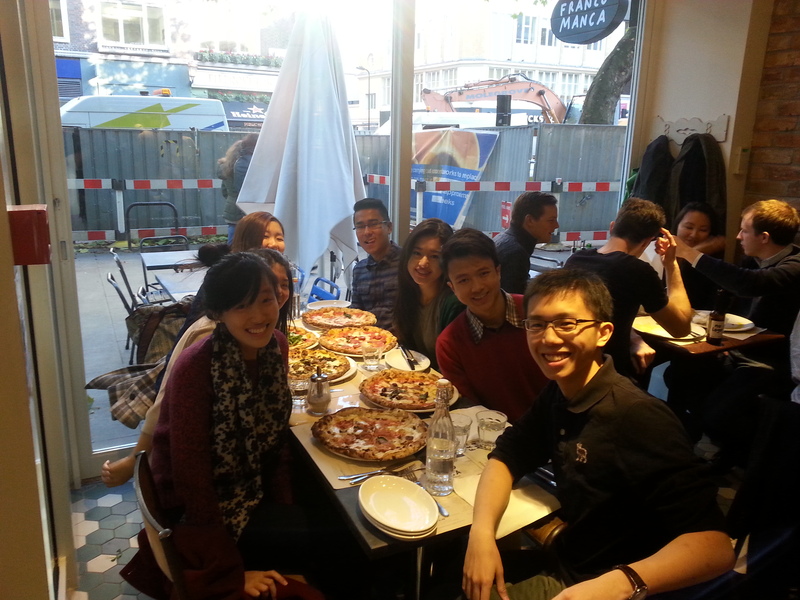 NB: despite the good food at extra virgin, pepperoni’s still remains a firm favourite of the boy’s and mine for pizza! its more reasonably-priced and also offers my all-time favourite heavenly extra large breaded portobello mushroom with chicken and a range of very good pastas!!! yum. PS. 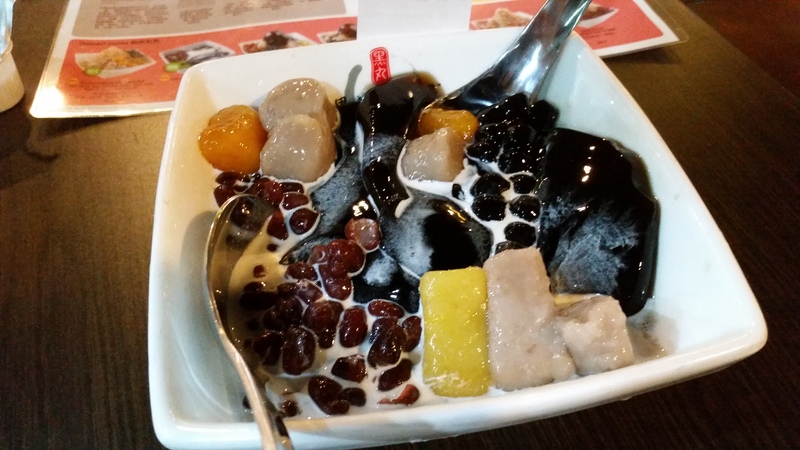 headed to black ball in the basement of united square to have some grass jelly dessert – yumz. #1 rule in eating/of life: no meal is ever complete without dessert. 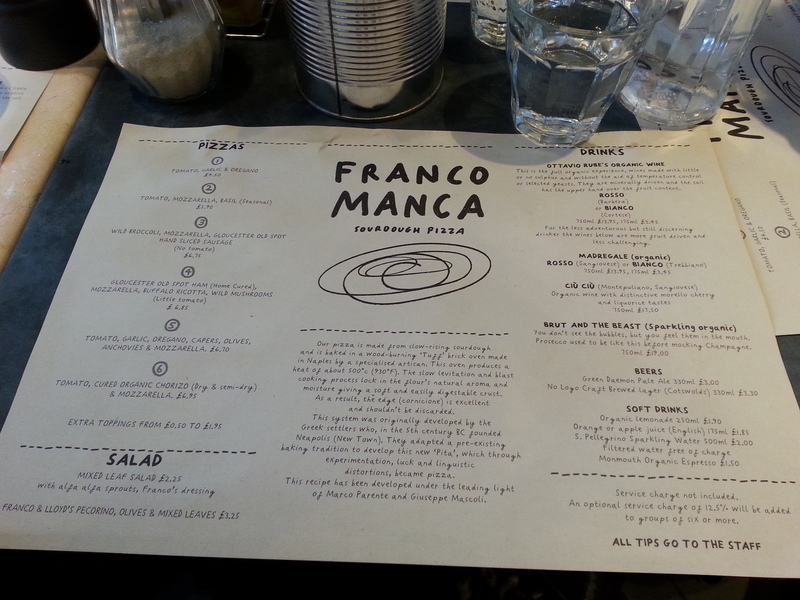 food options along tottenham court road have just gotten more exciting with franco manca’s recent opening of a new branch there! excitedly paid it a visit a few days ago, and we were not disappointed at all. 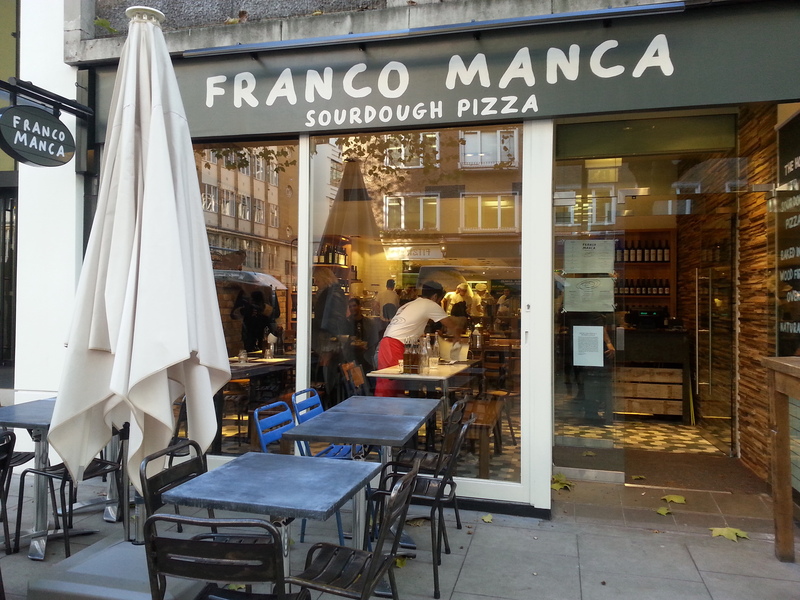 they only serve pizzas at franco manca (along with some simple sides), and what is special about them is that they are made from sourdough and baked in a special oven made in naples by a specialised artisan (all this info is found on their menu). the oven produces a heat of about 500 degrees celsius (wow), and the cooking process is supposed to lock in the flour’s natural aroma and moisture, giving a soft crust. this was my favourite of the lot! i loved how there was a little bit of tomato but not so much such that it became a tomato-based pizza; this made it different from what you normally get with most pizzas (either completely tomato-based or no tomato at all), especially those from pizza chains. the ingredients that topped it were also really yummy – the ham was delicious, as was the combination of cheeses. the mushrooms were just icing on the cake, because i really love mushrooms. admittedly the ingredients do look pretty sparse in the picture, but somehow it didn’t seem to be a problem when we were eating the pizza. i do think that everyone loves toppings though, so a little more would be highly optimal. but even without, it was really yummy. tasty and satisfying but still remaining light! this pizza has no tomato at all, which is probably why i didn’t like it as much as the rest! it was still very good and tasty, but i do like the what tomatoes bring to pizza. without any tomato at all, i felt that it wasn’t as flavourful – just cheese on (very good) pizza crust with some (good) toppings. we were quite puzzled by the description of the veggie as “wild broccoli” – maybe we are ignorant but we thought it seemed more like something similar to watercress?! (mosdef asian kids hahaha) i liked the chunky texture of the sausage – good quality stuff; definitely not the processed kind. somehow it tasted quite like lamb though? 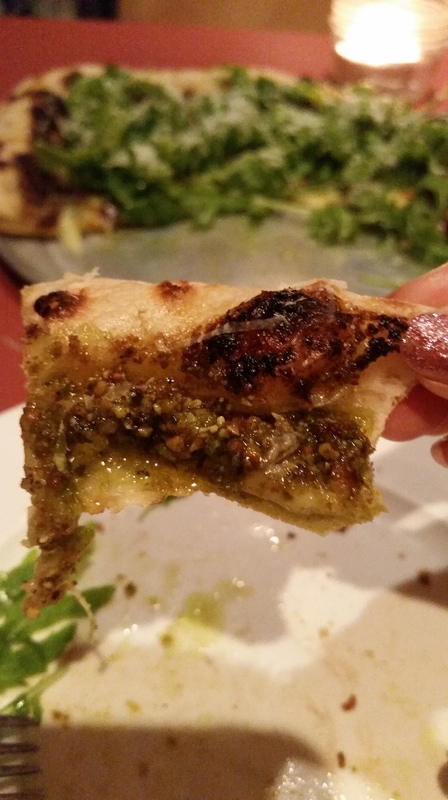 oddly, this pizza reminded me a bit of an indian-inspired naan-type thing…? without tomatoes, the taste of the delicious pizza crust really shone through! i love it when pizza comes topped with rocket and cheese (and parma ham oooh yum) so i quite enjoyed this. loved the tomato base, and the baked peppers that topped it were yummy! not the usual crunchy raw-ish peppers that you get on most pizzas. definitely a good vegetarian option. wonder what veg specials they have to offer on other days; it’ll be interesting to see what other exciting veggie toppings they have in store. this was simple but good! probably the best thing to order if you want to go back to basics. 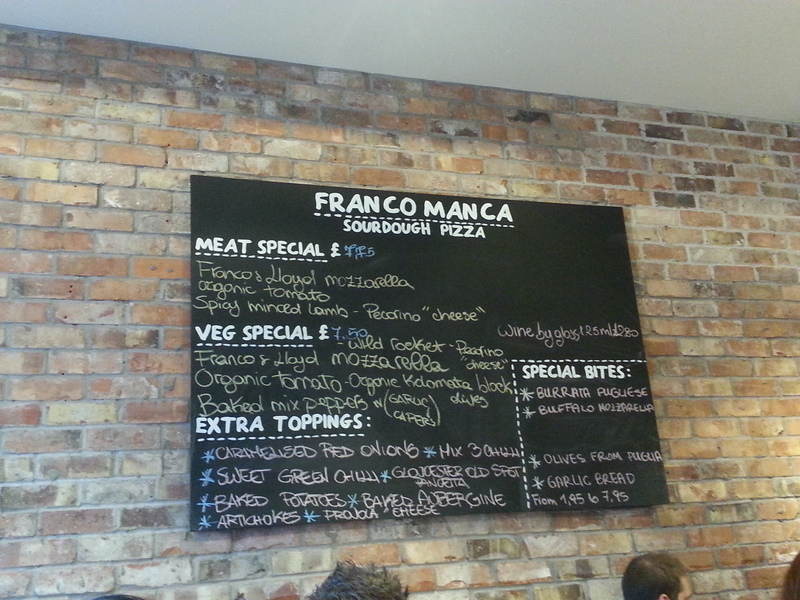 and because i really like their tomato, i thoroughly enjoyed this because that’s mainly what the pizza was about! this was my second favourite pizza! 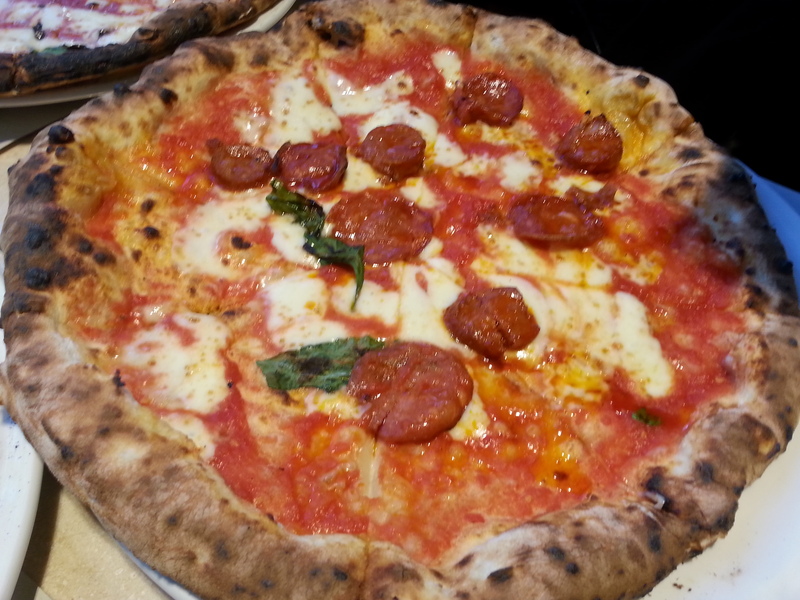 i loved the chorizo which was moist and juicy – the perfect addition to a simple tomato and mozzarella base. so good. i quite like anchovies and olives so i enjoyed this! but i can imagine that they are things that not everyone likes, so this might not be a hit for all. 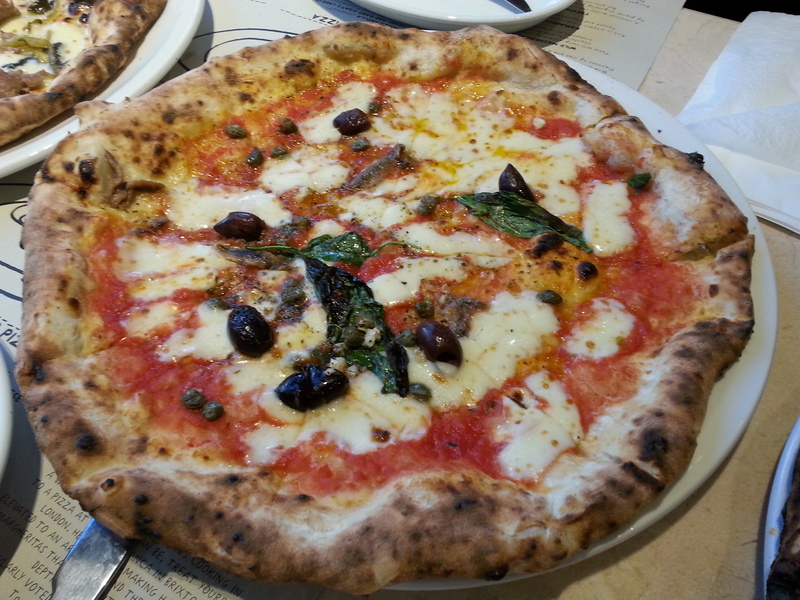 the anchovies added a nice saltiness and together with the capers and olives, i thought this was a pizza with very strong and satisfying flavours! my third favourite of the day. 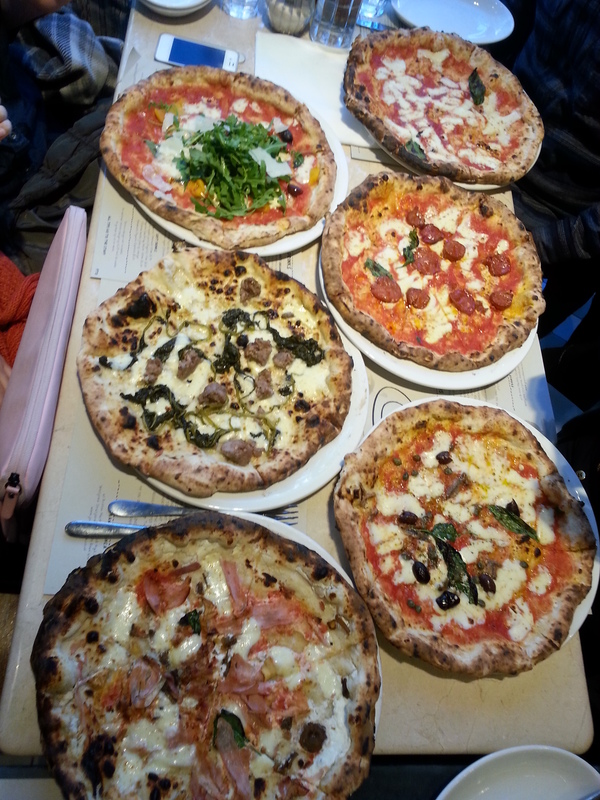 ultimately, i think the highlight of the pizzas at franco manca is definitely the crust – it is light, tasty, and crisp on the outside but delightfully fluffy inside. thin and with just the right amount of bite (i hate it when crusts are super thin and you end up feeling like you’re having something close to flatbread), i think you can’t go very far wrong with your order since all the toppings end up on the same amazing base. your choice of toppings is really a matter of personal preference, and they a good range of options 🙂 i definitely preferred the tomato-based ones though; thought they were tastier and hence more satisfying/hearty. 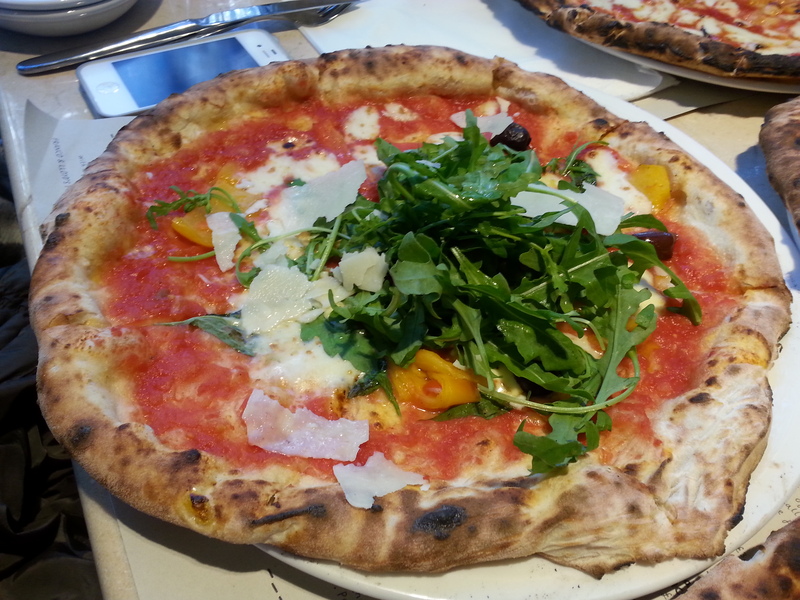 all the toppings used are also top quality – most of them are sourced directly from italy, and i thought the difference is taste was definitely noticeable. all this at an extremely affordable price too! 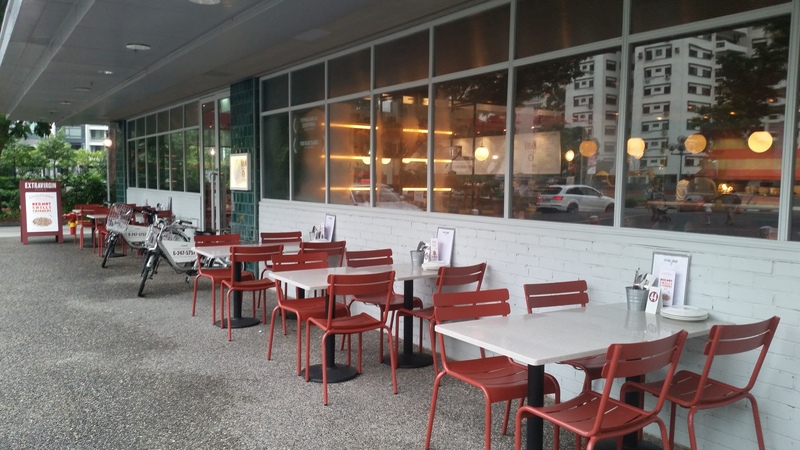 previously catering to mainly the working crowd at their first branch in the heart of the cbd at clifford centre, Platypus Kitchen is now catering to a more diverse clientele at 2 other locations – bugis junction and bukit timah plaza. i first heard about it when i was interning at raffles place last year but unfortunately never got the chance to try it during my short working stint. so i was really excited to hear about their new branches that are a lot more accessible to people who don’t fancy heading into the business district to jostle with the working crowd! 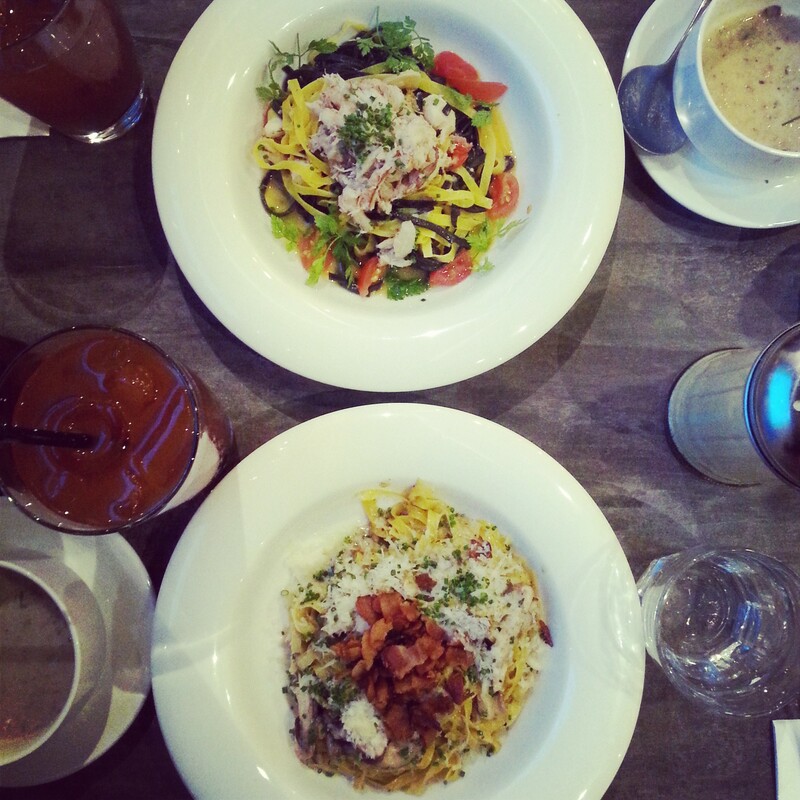 occupying a spacious area on the third floor of bugis junction, Platypus Kitchen prides itself on offering not only the widest selection of handmade pastas in singapore, but also as mediterannean bistro serving quality food at affordable prices. i paid the bugis junction outlet a visit last tuesday night, and thought they did pretty well at living up to the reputation they have created for themselves! the selection available in the set menu was surprisingly extensive and gave indecisive me quite a headache deciding what to get – everything looked/sounded so good! luckily we had decided that the set menu was too good to pass on, so that limited our choices to the (not so) few you see above; the main menu takes being spoilt for choice to a whole new level and is a real nightmare for the indecisive like me, though i suppose that is a happy problem? 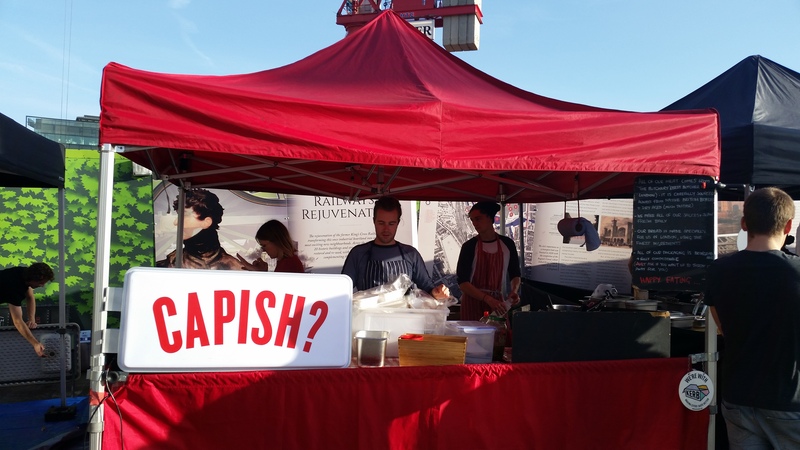 and a very good way of getting people to keep returning to try more of what they have to offer! 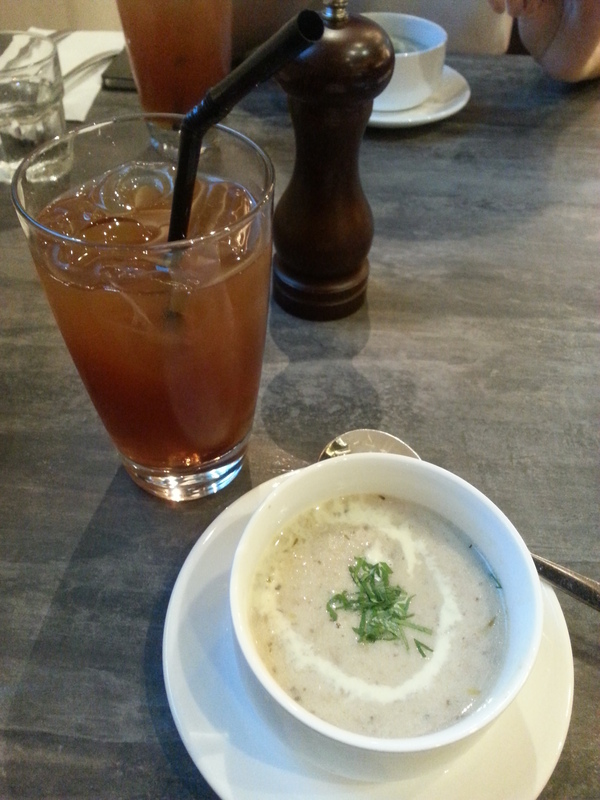 we both chose the wild mushroom soup as a starter which i felt was passable but certainly nothing to shout about. it had bits of mushroom in it that added a slight chunkiness which i like, but i thought the soup could definitely have been thicker and creamier. it seemed slightly watered-down (probably ladled out from a giant ready-made pot), and definitely could do with a bit more of a really fragrant portobello mushroom type of kick! but that said, maybe that’s too much to expect from a mushroom soup that comes as part of a set menu or otherwise at a very reasonable price of $3.90 a bowl. the drinks on the other hand, were really rather terrible. my lychee peach tea tasted nothing even remotely like lychee or peach! if not for the fact that there was a lone lychee bobbing around in the drink, i would have thought they’d sent the wrong drink. my friend’s mango peach tea was just slightly better, but both were as diluted as each other and just tasted like iced tea without the sugar syrup. a big disappointment, especially when i got excited by the range of interesting flavoured teas they had that came with the set menu. 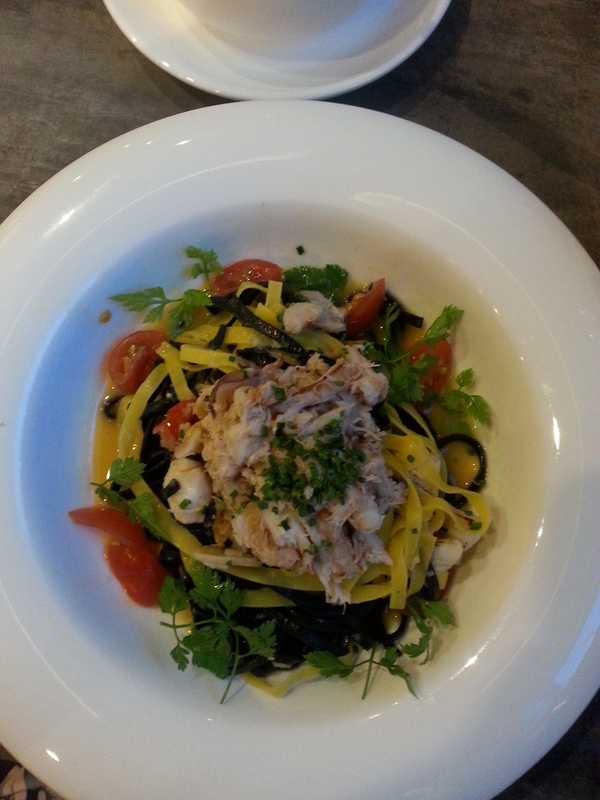 the black & white is something i will definitely go back to Platypus Kitchen for – a mixture of egg and squid-ink tagliolini with crab and scallops in a white wine consomme. i loved the mixture of noodle types, the white wine consomme which had a tinge of zestiness in it, and the generous servings of crabmeat and scallops. the ingredients were fresh and the consomme was light, its very subtle sourness giving the sauce a really refreshing lift. i absolutely loved this dish! the carbonara was much lighter than other carbonaras i’ve had (that have managed to leave me unable to finish the dish halfway through it – an extremely rare occurrence, i assure you); you can probably see that from the picture above! it wasn’t just the fact that the amount of sauce that the pasta was tossed in was less than normal, it was also the fact that the sauce itself (an egg yolk-based sauce, apparently) was quite light. i think the taste of truffle (that was rather strong) definitely helped to distract me from the usual creaminess in carbonaras that can sometimes be overpowering. 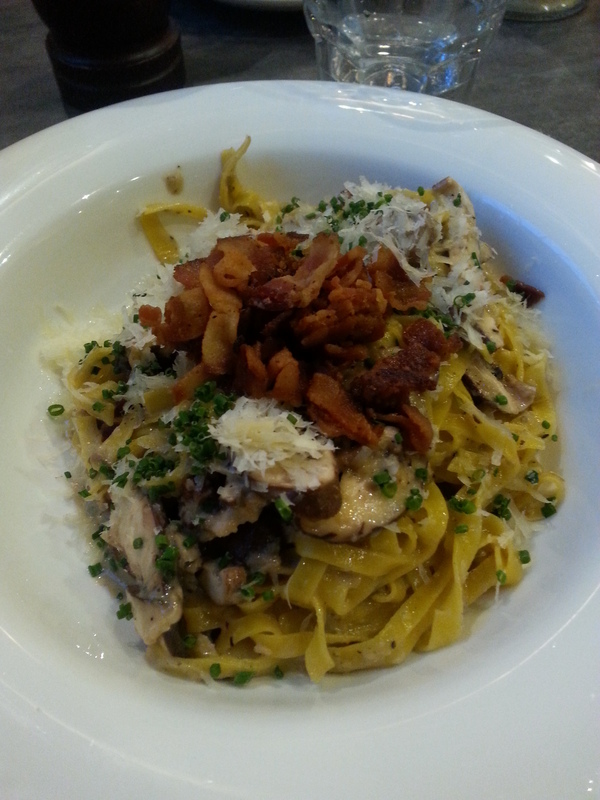 i also really enjoyed the mushroom slices, cheese and double-smoked bacon that topped the pasta pile. it was definitely one of the better renditions of carbonara that i’ve tried, but i still preferred the black & white since it was something more unusual. the most interesting/amusing part of the dessert was the popping candy that topped it. 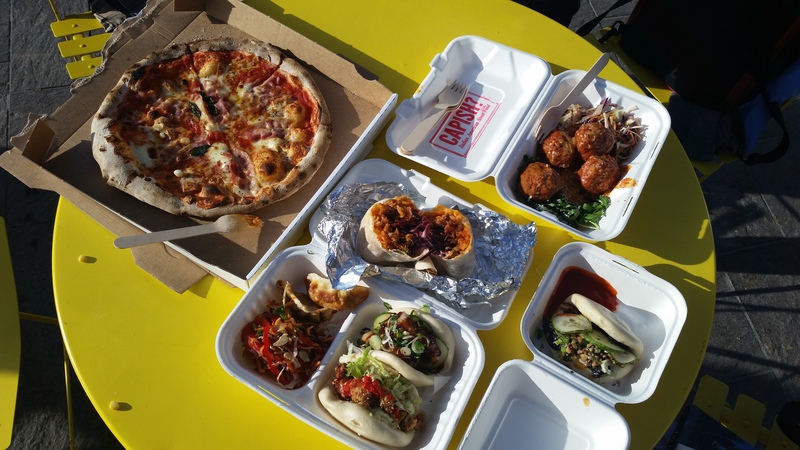 we only realised it was popping candy after we each took our first bites and started hearing loud crackling sounds emerging from the depths of our mouths – definitely awkward first date food… or on the other end of the spectrum, a (quite literally) sizzlin’ one? hahahahaha! 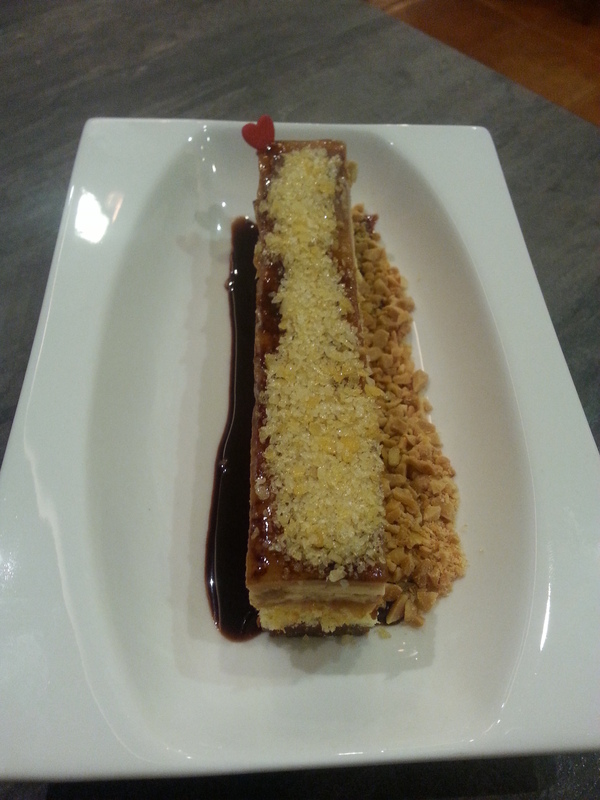 popping candy aside, the dessert wasn’t fantastic but it was a decent end to a good meal. there wasn’t a very strong sea salt caramel flavour at all – it seemed to have been lost in the chocolate sauce and peanuts that were rather distinct flavours in this seemingly confused cake. that said, it still succeeded in satisfying our craving for a sweet end to the meal. 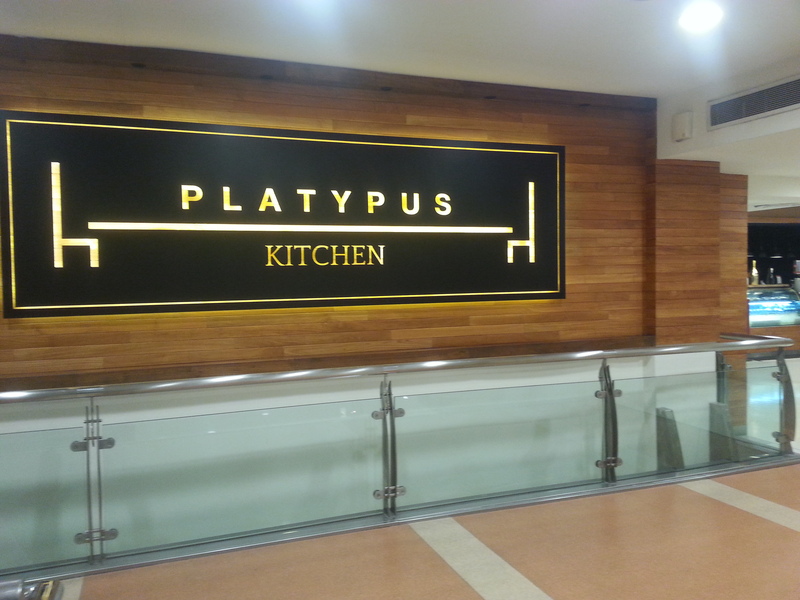 Platypus Kitchen is definitely a great place to go if you are looking for affordable gourmet pastas with quality ingredients. 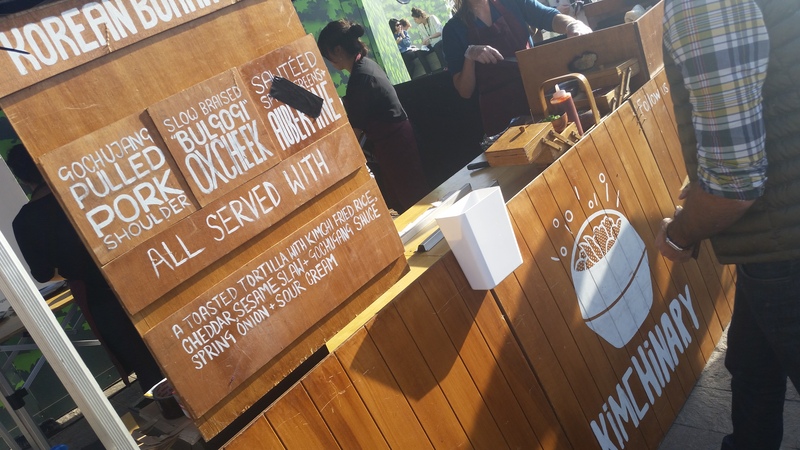 i’m already looking forward to the next time i get to return to try more of their exciting offerings! 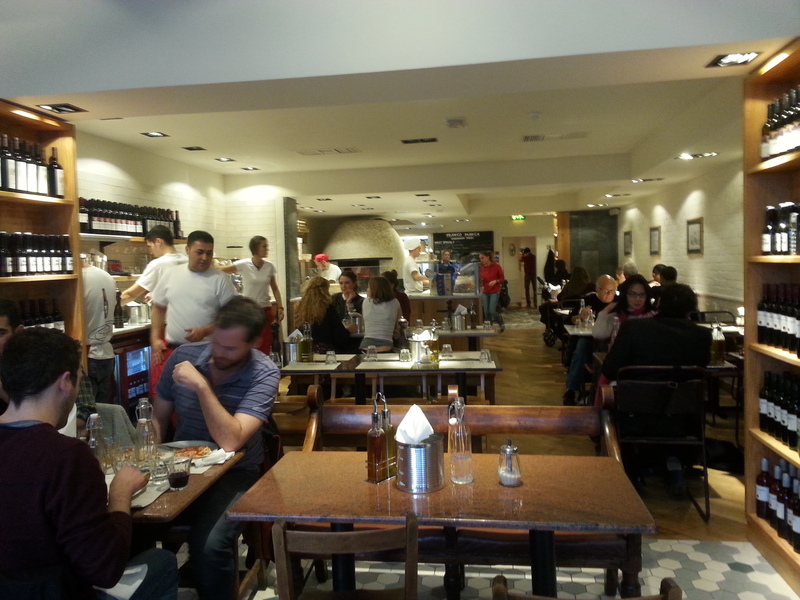 checked out this italian restaurant on a tuesday afternoon, and we enjoyed an amazing 50% off the food bill (an ongoing offer they have at their outlet at namly place)!!! 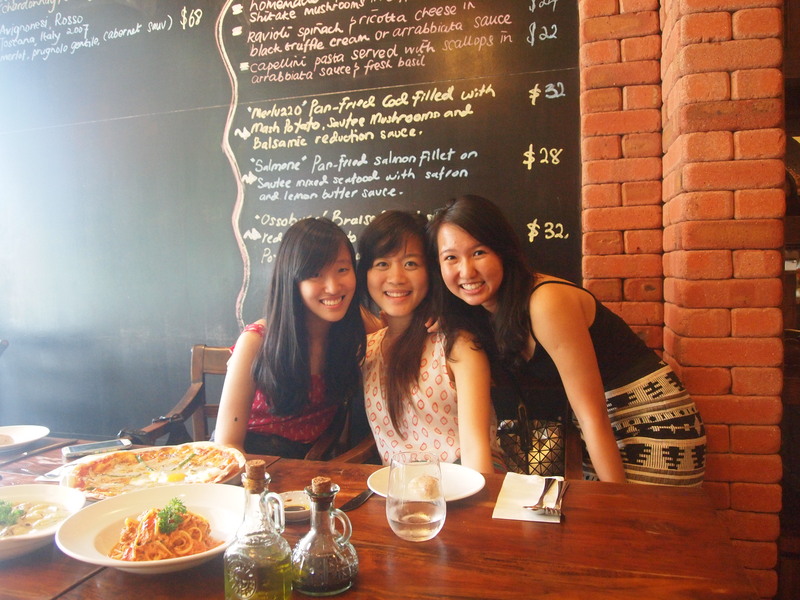 good food + great company + amazing discount + parallel parking success outside the restaurant = three happy girls. we had a late lunch at 130 and were the only customers when we arrived. they (rather unhappily; probably weren’t expecting any more customers for lunch) told us they were closing at 230pm but that didn’t deter us one bit! 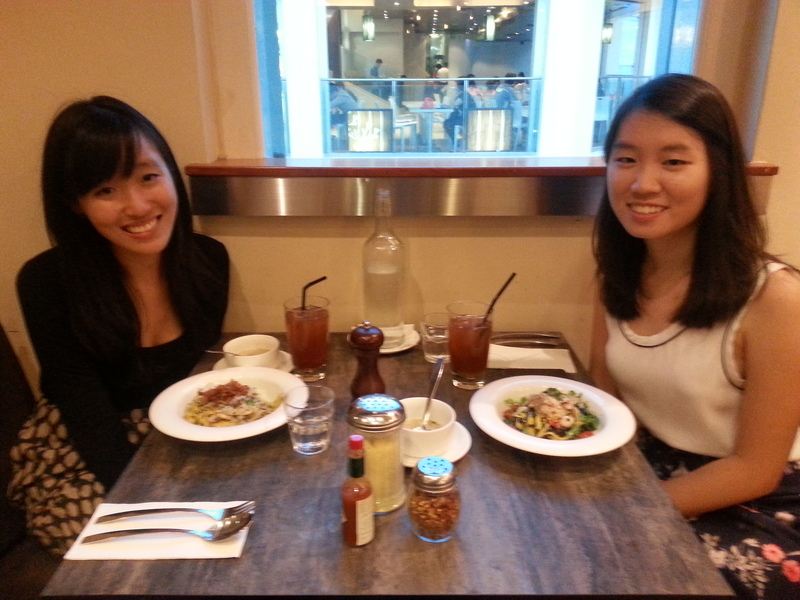 good food awaited us and we were ravenous! 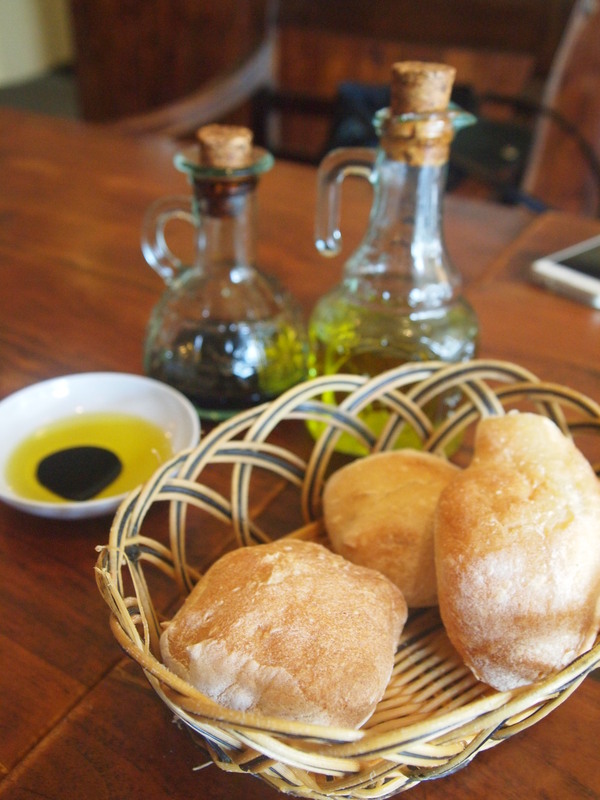 the meal started with some bread rolls which were nicely warmed up. 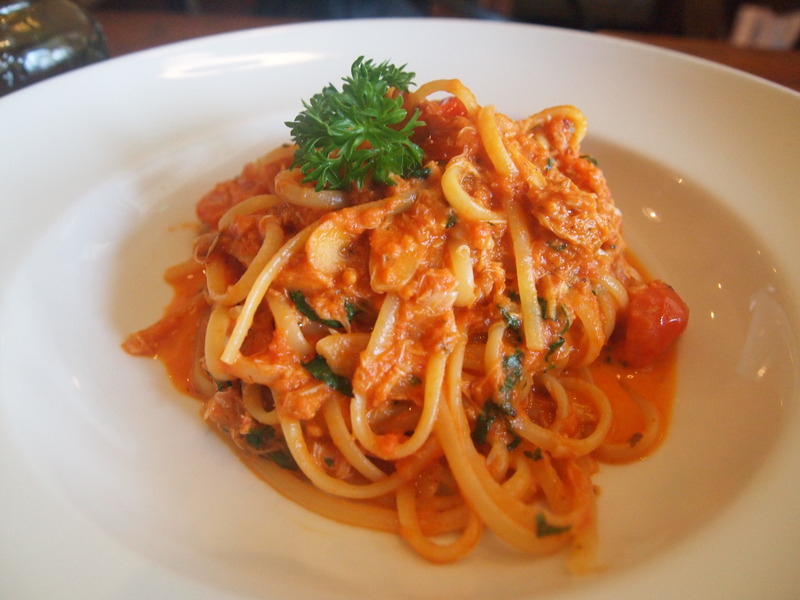 the first thing we ordered was a crabmeat linguine in creamy tomato sauce – this wasn’t on the menu but my friend requested it and they were more than willing to do it for us, which was nice. it was very good! the crab was fresh and they were generous with it – definitely not shredded up frozen crabsticks or anything of that sort. the sauce was also great, it had a cream base but was light and of a great consistency – thicker than normal tomato-based sauces but not too thick at all! 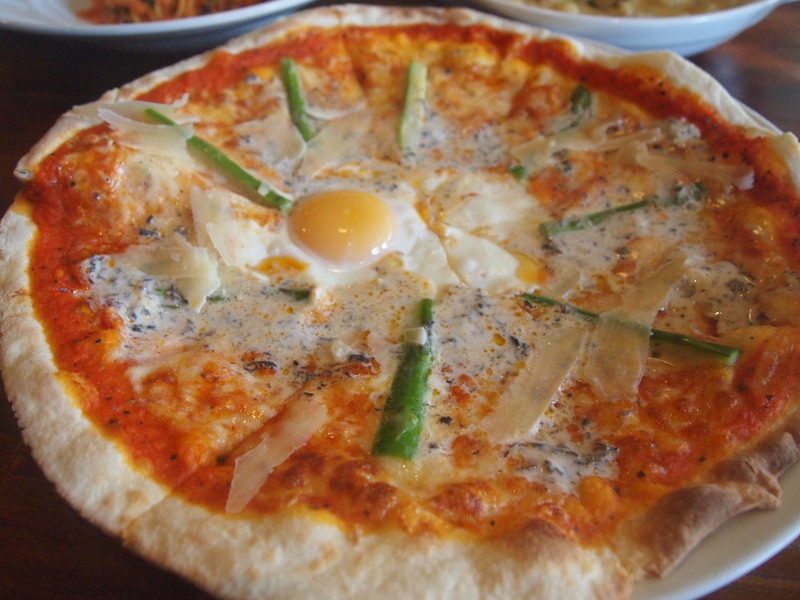 we also ordered their signature pizza which had tomato, mozzarella, parmesan, asparagus, egg and black truffle – it was a really delicious combination and this is something i would go back to la nonna for! 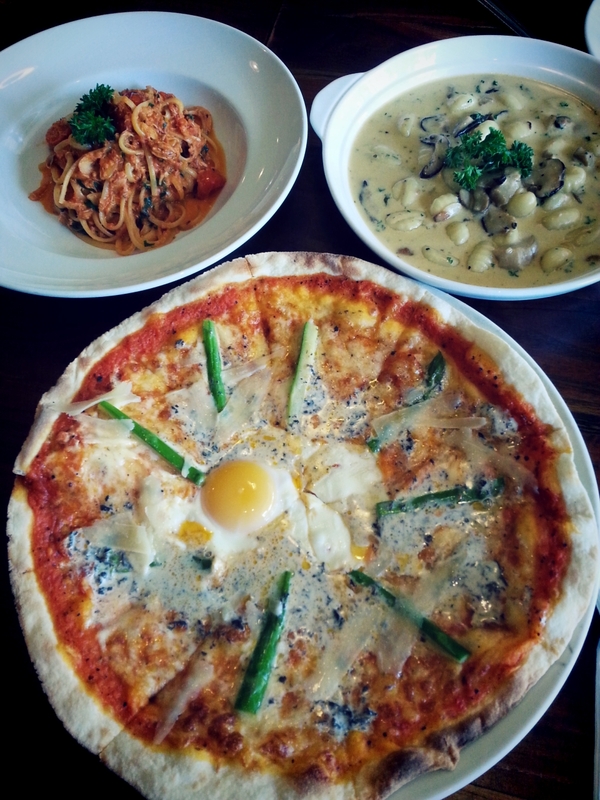 not just because i LOVE truffle, but also because of the wet egg yolk (MY FAVOURITE OMG), asparagus and the thin crust! 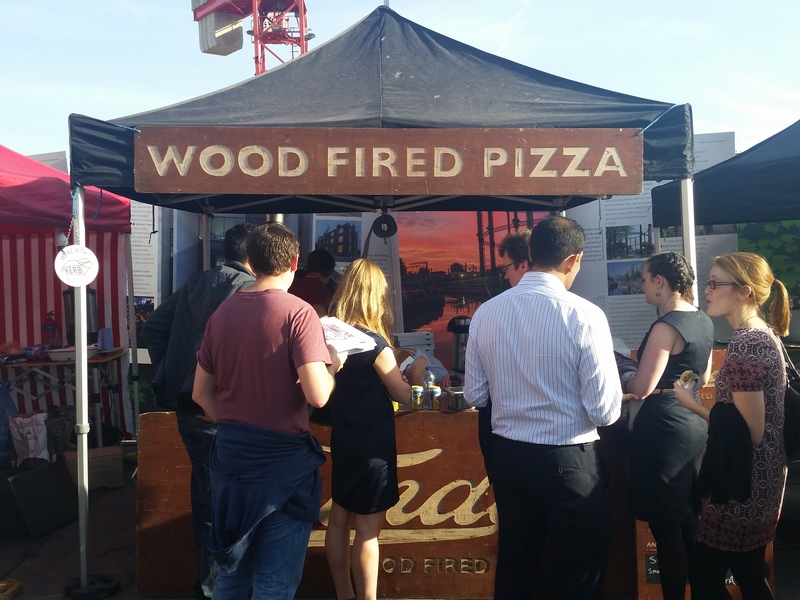 it was a light pizza and something very different from what you’d get from the commercialised pizza chains – the usual oily, unhealthy, processed pepperoni/pineapple/ham stuff. the third thing we ordered was the gnocchi. i can’t remember exactly what went into the sauce, but it was cream-based with a touch of lemon zest. 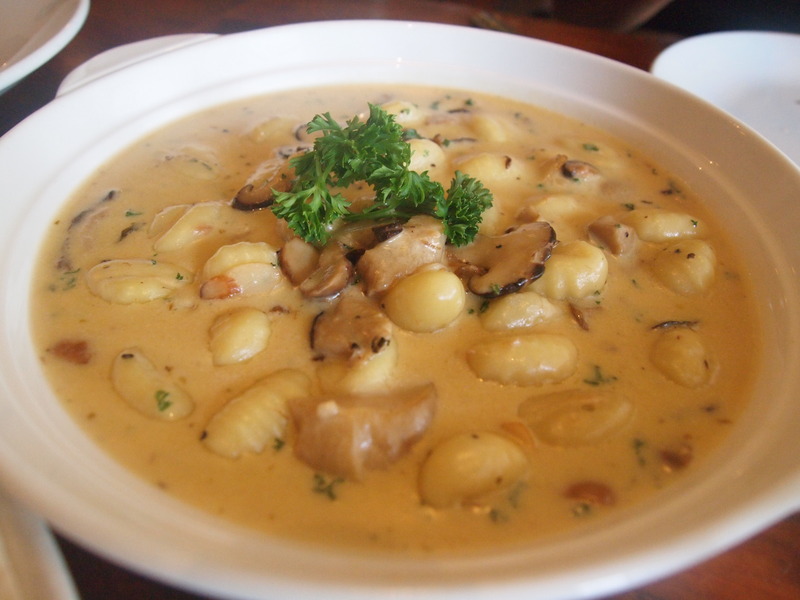 we agreed that we preferred antoinette’s version of gnocchi in cream sauce (though that one seems to be heavier), but this was not too bad either! the gnocchi was soft and quite fluffy, and the sauce was not too gelat (i realise i use this word a lot hahaha but it is really the most apt thing i can think of in many situations!!!). 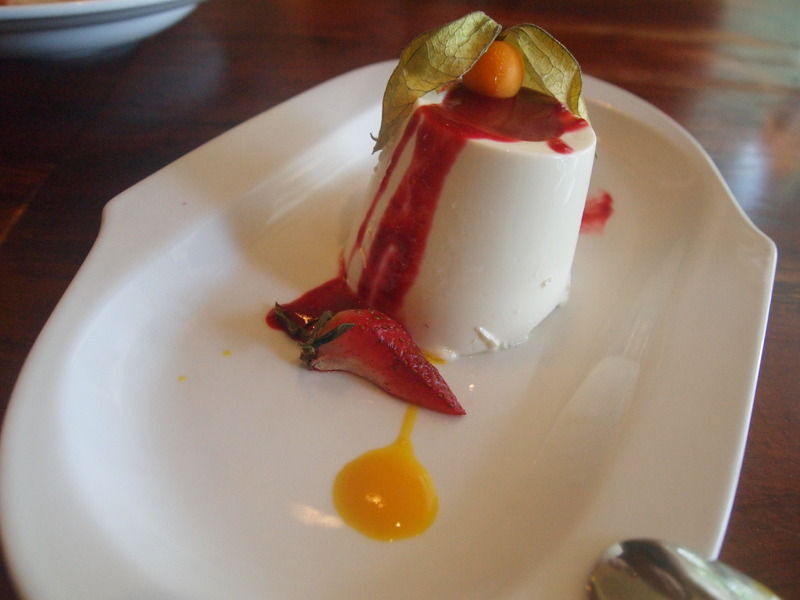 the servings were pretty big so by the time we got to dessert, we only had space for 1 to share – the panna cotta, which was really really good, and quivering away in all its wobbly goodness! it was extremely well done, and we derived great excitement from watching the wobbly tower threaten to collapse as the waitress brought it to our table. it was light, creamy and of the perfect texture – a great rendition of a classic italian dessert! who i would recommend this to: people who drive as the namly outlet is pretty inaccessible on foot. 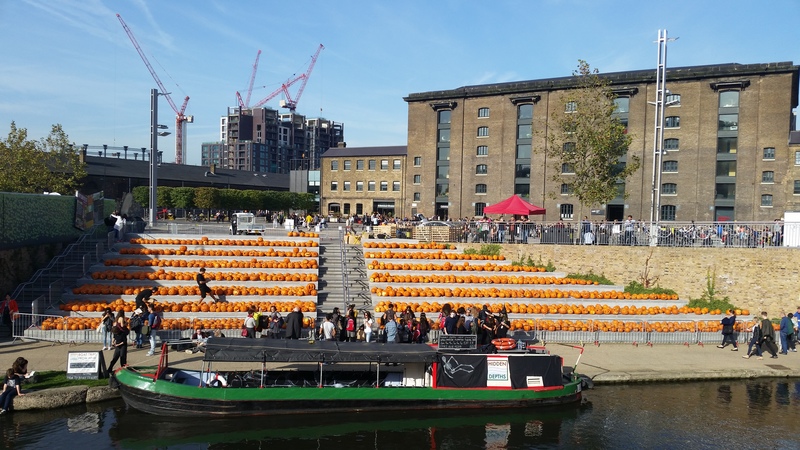 an alternative would be to go to the holland village outlet which is a lot more convenient to get to via public transport, but the offer there is a 1-for-1 offer instead of a 50% one. a place for a nice, casual, leisurely lunch with food that’s of a good quality and great value for money when the discount is available for lunch on weekdays! will i be back? 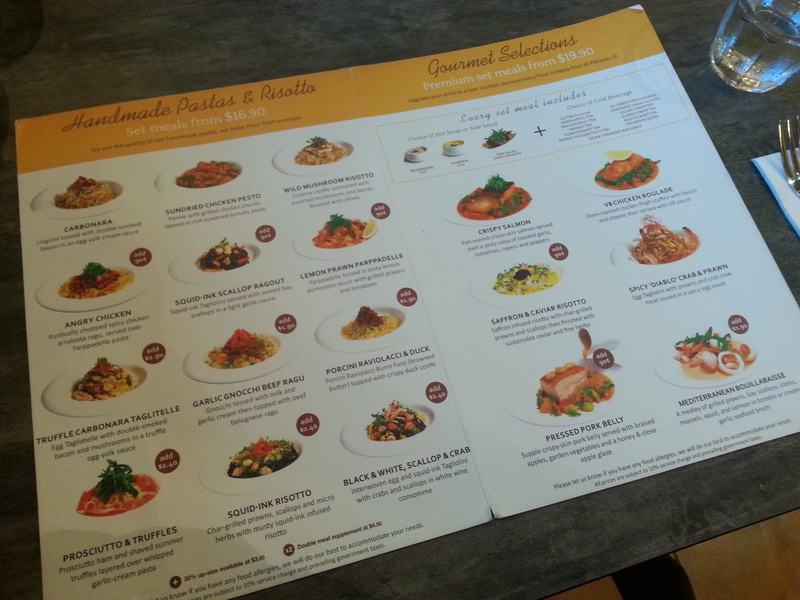 will definitely go back to enjoy the great savings at lunch and if i’m craving italian food!